According to The Toronto Star, the novel “Alias Grace” will be coming to CBC and Netflix very soon. Sarah Polley is still attached to the project, writing and producing the miniseries starting this August here in Ontario. Mary Harron will be directing. I can’t wait to see this book come alive, and if it’s on Netflix we’ll be able to binge-watch and re-watch to our heart’s content. Although the tragic “servant kills master” tale isn’t a recent invention, it’s always interesting to find a story that not only mirrors one we’re familiar with, but happened in the area where we live. The Massey Murder: A Maid, Her Master and the Trial That Shocked a Country is similar to Alias Grace in that it occurred in Toronto, the “master” was the black sheep from a well-to-do family, and the killer was a servant girl. But the books themselves could not be more different. I’m currently reading The Massey Murder and while it outlines the story of the trial and all the people involved, the city itself and the time period the murder happened in is described in much detail. It’s a fascinating record of the prevailing thoughts and attitudes of the early 1900s – a time when “he tried to ruin me” was all that a police officer needed to hear in order to know that the accused meant she’d been compromised in some way by her employer. The Torontoist/Historicist gives a fantastic, condensed account of what the book covers, including commentary on women’s issues during the time period and should tempt you to pick up Charlotte Gray’s book. If you’re looking for a great read that makes the history of Toronto come alive, while digging into the sordid affairs of a single event that animated everyone’s tongues almost 100 years ago, this is your book. I’m enjoying the writing so far and would definitely recommend it as a book club read or for anyone who enjoys a story of people behaving badly. Anyway, I’ve attempted to get the latest pattern for you finished several times but the program gets too sluggish to work on or my computer crashes and loses my files (note to self: spend less on fabric, buy new computer). I want to update the template I’ve been using as well so that is in the works. The free quilt pattern after this one will involve curves so I am still trying to decide if it will be best for me to continue to invent a pattern for you (so that all the patterns will be downloadable) or link to a site with an established template. I am confident in creating my patterns, though, and derive such joy in sharing them with you, that I really want to continue to provide original patterns for you. In between all of this is “real life” – what could be described as something you have and I do not – I am the original get a life, girl! recipient. I have been writing a lot, and doing my boring geek work, working out, sewing, arranging my studio, and playing with music instead of doing things like, you know, leaving the house. While my shoulder is gradually getting better (3 years of this is quite enough, thank you!) I am able to get more done. So while it’s a summer of sewing I do hope to get some content up here for you. 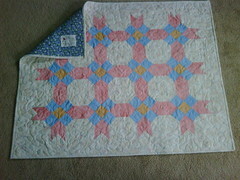 And some photos of some lovely barn quilts as well. I’ve been listening to an audiobook about Nelly Ternan, who was Charles Dickens “secret” mistress, called The Invisible Woman By Claire Tomalin. Not much is known about Nelly and her relationship with the writing legend as letters between them were burned and those who knew about the affair refused to speak or write about it. Until recently, that is. We all know that even “good girls” can mess up and find themselves in a terrible situation – perhaps accused of committing a couple of murders, like our gal Grace. While trying to find more information online about Nelly I found a great blog called “Scandalous Women” (tagline: “Well-Behaved Women don’t make History”) by author, actress, and amateur historian Elizabeth Kerri Mahon. It’s a fantastic trip into gossip, scandal, brutality, and lies. While Nelly Ternan had her secrets kept for her for decades, not everyone has the luxury of having their misdeeds protected from public eyes (or prosecution). I found a site that that mentions both women and men behaving badly (possibly romanticizing them in the process – the writer’s intended consequence or not) and they have written about Grace Marks: Murderpedia. Is there a website or other resource out there that indulges your appetite for scandal? Maybe HuffPo or TMZ or some magazine rack crap from the local store? I’m more of a historical scandal-reading person myself, but I’d love to know what you’re reading to find out all the juicy gossip. The Denver Post Archives is publishing 25 quilt patterns from the 30s written by Ruby Short McKim (1891-1976). These interesting historical patterns are past Grace’s time in Alias Grace but the patterns are still relevant because they are hand-pieced and some blocks traditional to the time Grace would have been piecing them herself. They will be publishing a new pattern every weekday for 25 days, including the “This Is The Way New Patchwork Quilt Will Look When Complete” article. This resource is much more recent than my own Great-Grandmother’s Ladies Art Co. 1914 quilt pattern book but it will come in handy to compare my own piecing techniques while creating patterns for this site. 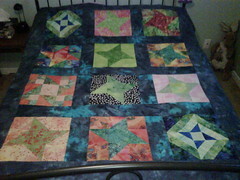 From the finished quilt it looks like there will be fans, baskets, trees, flowers, crosses and ferns to make. There are also a lot of curves and intricate pieces to sew together, and a few appear to be in Margaret Atwood’s Alias Grace, so I hope you too will find this a valuable resource when you are hand-piecing (or figuring out ways to modernize) your own historic quilt. If you’re dealing with snow at all this season, by now you’re probably sick to death of the white stuff and are dreaming of bright colours and springtime. And nothing says colour like a gorgeous barn quilt. Here are a few recent news items about barn quilts and quilt trails that will get you out of the winter doldrums and believing again that warmer seasons do indeed exist. A project that brings together visitors and locals!